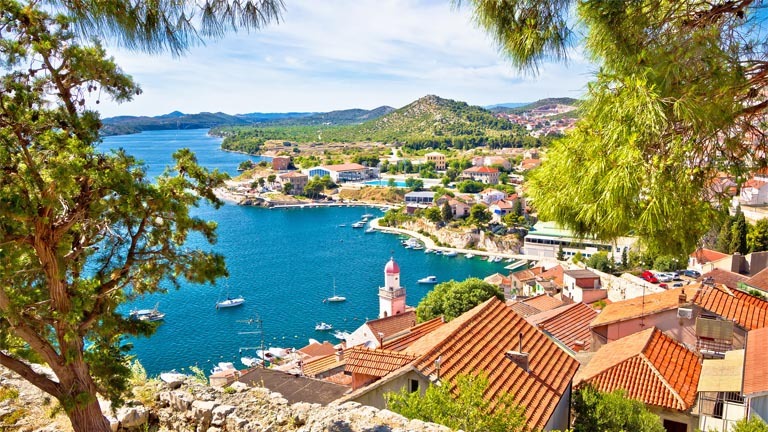 The oldest native Croatian city, Šibenik is a historic Mediterranean town, famous for its densely indented archipelago. Šibenik's archipelago consists of precisely 249 islands, islets, and reefs. A heaven for nautical tourists, indeed. With our Šibenik region sailing guide, you will explore the region in no time and visit all the region highlights. Yacht charter in Šibenik offers various opportunities for sailors. 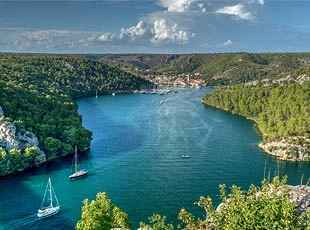 Skippered yacht charter is a very popular choice among tourists who want to visit National park Kornati, the densest archipelago in the Mediterranean. Of course, if you feel up to the challenge, book a bareboat yacht charter. Novice sailors can practice sailing near Murter island. Speaking of, Murter and Obonjan islands are a must-visit destination for young (at heart). When you're done with partying and island-hopping, charter a catamaran or a motor yacht to get some rest on Prvić, Žirje and Zlarin islands. 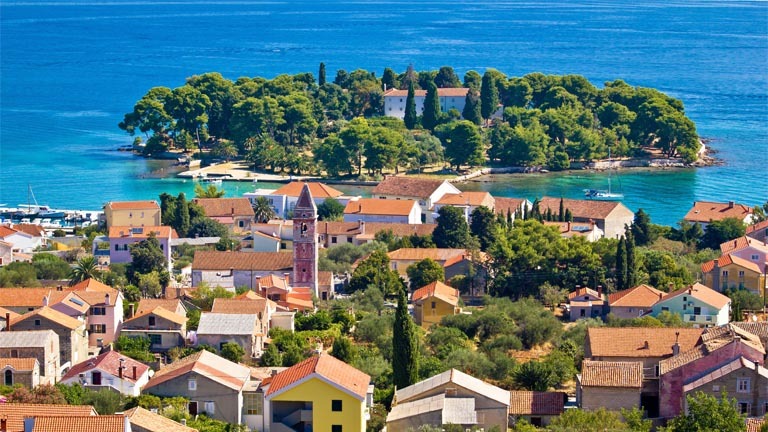 Or sail along the coast and book a berth in charming little cities like Primošten, Skradin, Tisno, and Vodice. During summer, be sure to book a berth in advance since it gets very crowded in marinas and ports. Your sailing adventure starts in Šibenik, a town built below the old Croatian fortress St. Mihovil, which still dominates the town’s panorama. St. Jacob’s Cathedral is yet another impressive building, and was considered a wonder when it was built, from both artistic and constructional point of view. Today, it is part of the UNESCO World Heritage List. D-Marin Mandalina is here for the safest mooring in Šibenik with more than 400 berths. Supplied with all amenities, the new and modern marina accommodates superyachts up to 140 m long. From Šibenik, sail towards the island of Kaprije. 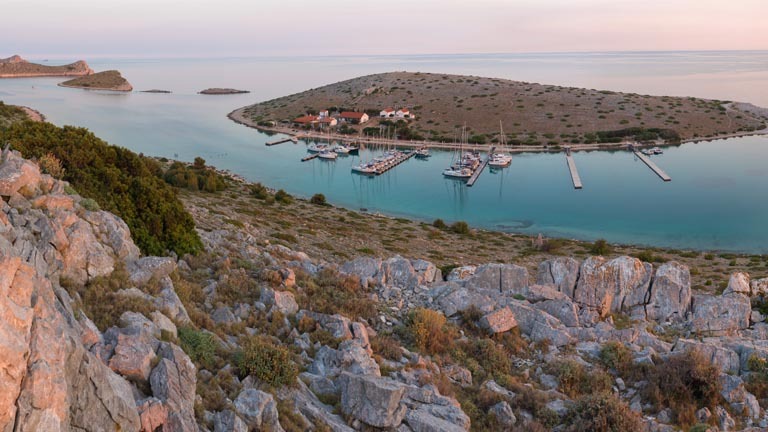 Naturally sheltered from all winds, Kaprije harbor on the northwest part of the island provides a safe place for berthing to many yachts. It is an ideal spot for sailors who wish to relax and try out some homemade specialties. 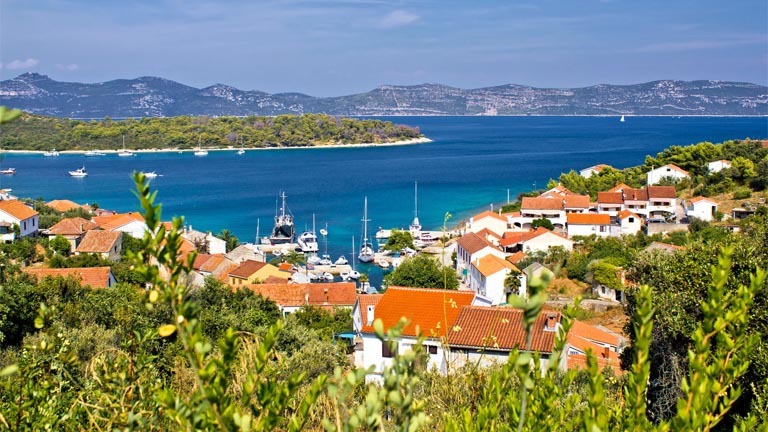 Kaprije attracts sailors with its beauty, sea rich with fish, and small private bays. To the left is Kakan islet, which protects Kaprije from the waves and winds coming from the south. This islet is attractive to sailors who like peace, quiet and untouched nature. The weather in this region is stable, summers are dry with nice Maestral blowing, while you can expect the southern wind jugo in spring and fall. On your 2nd day you will enter Kornati National Park from its most southern part, passing the islands of Smokvica Vela and Kurba Vela. Sailing through Kornati, the densest collection of islands in the Mediterranean, presents a great adventure to every sailor. The cliffs of Kornati, the so-called crowns, and their underwater extensions, which go all the way to 1,000 m deep into the sea, will leave you breathless. Today, these islands are mostly uninhabited, and traditional houses are turned into taverns and restaurants. Sail towards the Opat bay on Kornat island along its east coast if the southern wind jugo starts to blow, or along the west coast in case of the northerly wind bura. On the northeast part of the bay, you can find a restaurant and a place to moor your boat. At the bottom of the bay, there is sand and sludge, so the anchor will hold well. As the Opat bay is open to the south wind, you can seek shelter in the nearby Koromačna bay. The southernmost part of Kornat turns purple from sage, which grows on the barren parts of the island in springtime. Moor in ACI Marina Piškera, or choose one of the following anchorages: Lavsa island, Vrulje bay. To wake up in Piškera, a marina on the island of Panitula, is a truly unforgettable experience. From the beginning of April to the end of October, the friendly personnel will take care of all your needs. The marina is well-protected from the northerly wind (bura). There is a restaurant, and you can refill your water and connect to the electrical power aggregate. 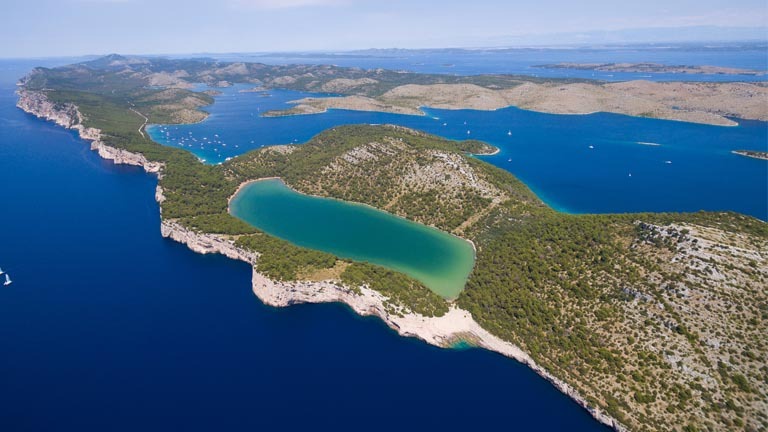 In the close vicinity of Kornati National Park, there is Nature Park Telašćica. There are three phenomena that characterize this park. 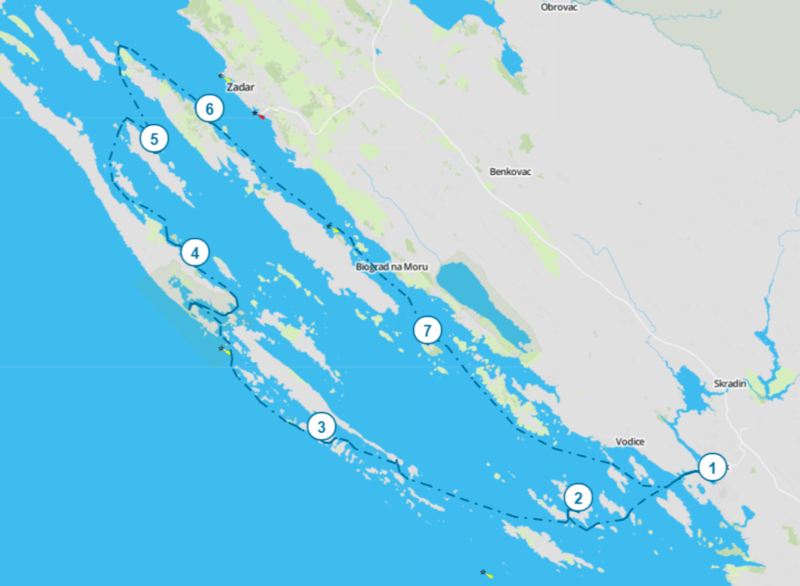 The first one is the unique Telašćica bay, which is the safest and largest natural harbor in the Adriatic Sea with 25 coves, 5 islets, and 69 km of indented coast. The second phenomenon are the steep rocks of Dugi Otok island, which rise up to 200 meters above the sea level and descend into the depth of 90 meters. The third phenomenon is the salty lake Mir, with its therapeutic properties and a mixture of sea and fresh water, which is about 6 °C warmer than the seawater. You can also reach Sali, a small fishing town rich with history, by simply walking to it. Your night in Telašćica will be filled with the scent of pines, the murmuring of the sea and the song of the crickets. From Telašćica, sail north to the island of Iž. This interesting island is situated in the middle of the Zadar archipelago, between the island of Ugljan on the east and the island of Dugi Otok on the west, and is surrounded by ten little islands. Its well-intended coastline offers many opportunities to drop the anchor and enjoy the nature. The heart of the island is a village called Veli Iž, set in the middle of the east coast, just across the island of Ugljan. There is also Mali Iž, situated on the south-eastern side of the island. The adjectives “mali” and “veli” can be translated as “the little one” and “the big one”, and indicate the historic size of the villages. Nowadays, Mali Iž, the little one, has extended its borders, merged with surrounding villages and has actually become bigger than Veli Iž. The marina in Veli Iž is very well-organized, and is equipped with moorings, electricity, fresh water and public facilities. 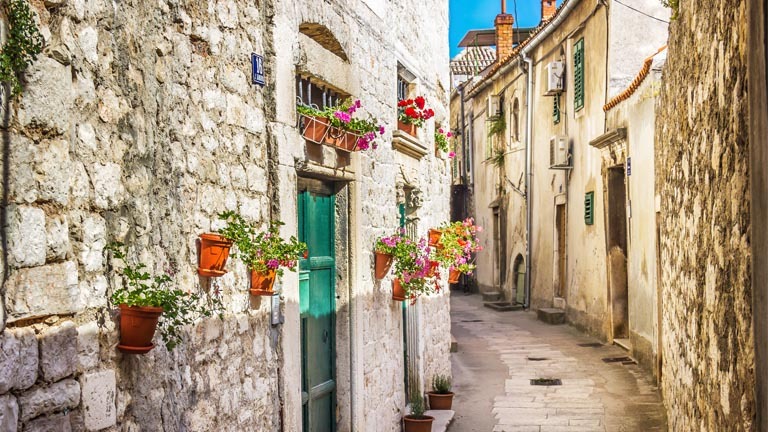 Those who have had to eat dry or canned food aboard their yacht for days will have an opportunity to taste delicious Croatian/Mediterranean cuisine in any of local taverns and restaurants. A fully-equipped downwind marina that offers annual, monthly, winter, summer and daily berths is perfect for every sailor. It offers wide gastronomic offer with fresh fish, quality meat and home-grown ingredients. Preko is a cultural centre of the island of Ugljan with amazing beaches and an especially beautiful view from St. Michael's peak. Make sure to check out windmills on the nearby island of Ošljak. The island of Ugljan altogether will charm you with ancient ruins, churches and summer houses, as well as olives and figs that serve the most important agricultural role. Northeast side of the island is inhabited and has tourist places and nice pebbled and rocky beaches, while the other side of the island is uninhabited and is perfect for quiet cruising the deep blue sea. 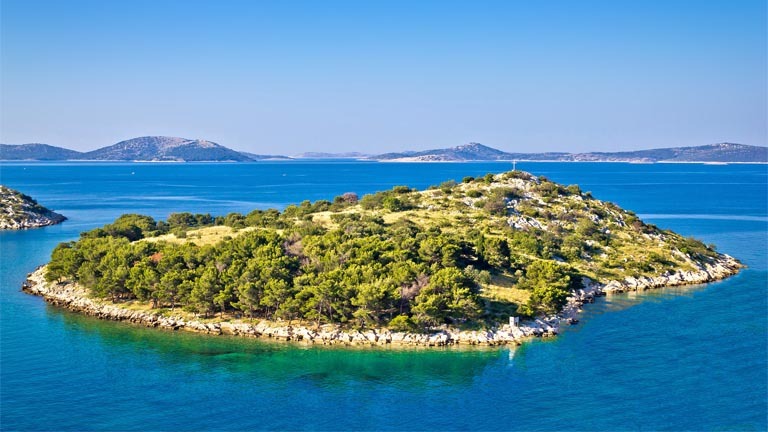 The small, hilly and pine wood-covered island of Vrgada is located halfway between the cities of Zadar and Šibenik, and in the archipelago surrounded by Pašman, Kornati and Murter islands, as well as 15 islets. Such indented coast makes a perfect sailing holiday destination. The main harbor is Luka bay on the northeast part of the island, which offers a good protection except eastern winds. There is another bay Sv. Andrija, sandy bay and a better shelter, although, be careful since the bay is shallow. The golden-yellow sand beaches are a natural and long-lasting heritage of the island, and ideal for swimmers and naturists. One can also camp and enjoy the peaceful nights on this carless island. Only one settlement is on the island, also called Vrgada, where locals do fishing, tourism and agriculture. The latter is especially important for ancient species of vegetables (chickpea, beta, leaf cabbage, grass pea). One can also find protected plant species and medicinal herbs on Vrgada. In the past Vrgada was an important monitoring point of the Adriatic nautism. This is why you can find the ruins of the medieval fortress. On your last day, sail towards your starting destination, Šibenik. Enjoy your time on the yacht, take a swim in the warm sea, and explore this beautiful city in case you didn't have time to do it on your first day. Interested in Sailing Holiday in Šibenik Region?